DOWNWIND SAILS PRODUCT GUIDE CRUISING DOWNWIND SAILS What started as a simple, multi-purpose asymmetrical spinnaker design has been transformed into a sophisticated series of spinnakers specifically designed for the unique requirements of cruising sailors. A direct descendent of our racing designs, Quantum’s cruising spinnakers provide unmatched levels of control, stability, and reliability. 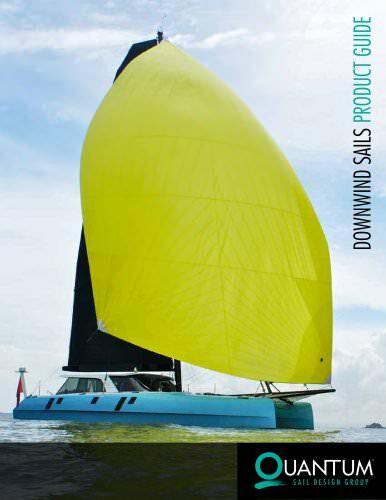 Developed using the leading off-wind design program and wind tunnel testing, each asymmetrical spinnaker model is optimized for specific wind angles while offering versatility for a broad range of uses. All spinnakers feature multi-panel, tri-radial construction for accurate 3D shaping, smooth flying shape, and precise alignment of loads. Only the highest quality nylon, polyester, and laminate spinnaker materials are used, and attention to construction details ensures rugged durability and dependability. STANDARD FEATURES • Corner reinforcements spray-glued for maximum bonding area and smoothness. • Narrow head gores reduce diagonal load on seams. • Fanned radial patches distribute loads and minimize weight at corners. • Numbers are inked to minimize weight and smooth center sections. All spinnakers include inked numbers, leech and foot control lines, and sail bag. Graphics are applied using different methods and materials depending on design, usage, and budget. Please contact a Quantum® Rep for more information. CRUISING SPINNAKER POLAR CHART Photo Credits: Matias Capizzano (inside) 010114©2014 Quantum Sail Design Group, LLC. All rights reserved.